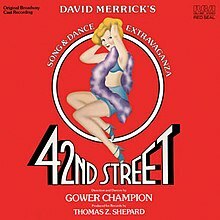 42nd Street is an American musical with a book by Michael Stewart and Mark Bramble, lyrics by Al Dubin and Johnny Mercer, and music by Harry Warren. The 1980 Broadway production, produced by David Merrick, directed by an ailing Gower Champion and orchestrated by Philip J. Lang, won the Tony Award for Best Musical and became a long-running hit. The show was produced in London in 1984 (winning the Olivier Award for Best Musical) and its 2001 Broadway revival won the Tony for Best Revival. Based on the novel by Bradford Ropes and the subsequent 1933 Hollywood film adaptation, the show focuses on the efforts of famed dictatorial Great White Way director Julian Marsh to mount a successful stage production of a musical extravaganza at the height of the Great Depression. The show is a jukebox musical of sorts, in that, in addition to songs from the 1933 film 42nd Street, it includes songs that Dubin and Warren wrote for many other films at around the same time, including Gold Diggers of 1933, Roman Scandals, Dames, Gold Diggers of 1935, Go into Your Dance, Gold Diggers of 1937 and The Singing Marine. It also includes "There's a Sunny Side to Every Situation", written by Warren and Johnny Mercer for Hard to Get. A 2017 revival added the song "Boulevard of Broken Dreams", written by Warren and Dubin for Moulin Rouge. Producer David Merrick "took a huge gamble with his $3 million production based on the 1933 Warner Brothers film musical", as "only one other show had made the transfer from original movie musical to the stage — Gigi, a flop in 1974." He felt audiences once again were ready to embrace the nostalgia craze started by the successful revivals of No, No, Nanette, Irene, and his own Very Good Eddie several years earlier, and augmented the familiar songs from the film's soundtrack with a liberal dose of popular tunes from the Dubin-Warren catalog. According to theater historian John Kenrick, "When the curtain slowly rose to reveal forty pairs of tap-dancing feet, the star-studded opening night audience at the Winter Garden cheered...Champion followed this number with a series of tap-infused extravaganzas larger and more polished than anything Broadway really had in the 1930s." In June 1980, the musical premiered in out-of-town tryouts at the Kennedy Center for the Performing Arts in Washington, D.C. The musical opened on Broadway on August 25, 1980, at the Winter Garden Theatre, and then moved to the Majestic and finally to the St. James, closing on January 8, 1989, after 3,486 performances and 6 previews. (Frank Rich called this a sign of the "shift of power" on Broadway, as the show had to leave the Winter Garden to make way for Cats and the Majestic to accommodate The Phantom of the Opera.) The original cast included Jerry Orbach as Julian Marsh, Tammy Grimes as Dorothy Brock, Wanda Richert as Peggy Sawyer, and Lee Roy Reams as Billy Lawlor. Replacements later in the run included Barry Nelson and Don Chastain and Jamie Ross who played Julian for the last three years of its Broadway run, Elizabeth Allen, Dolores Gray and Millicent Martin as Dorothy, and Lisa Brown and Karen Ziemba as Peggy. (Karen Prunzik, who originated the role of Anytime Annie, briefly played the role of Peggy when Wanda Richert became ill and her understudy abruptly quit the show.) The show's designers, Robin Wagner (sets), Theoni V. Aldredge (costumes), and Tharon Musser (lights) were the same team who had designed the original Broadway production of A Chorus Line. The original Broadway production is the 14th longest running show in Broadway history, as of September 22, 2015. However, the opening night triumph was overshadowed by tragedy. Following a lengthy standing ovation, Merrick went onstage and stated, "This is tragic...Gower Champion died this afternoon." He went on to explain that Champion died hours before the performance, "when he said that Mr. Champion had died, there were gasps and screams." The producer had told only Bramble of Champion's death and managed to keep the news a secret from the cast (including Richert, the director's girlfriend), crew, and the public prior to his announcement. 42nd Street proved to be not only Champion's last show but Merrick's final success. Merrick lived until 2000, but, as described by Anthony Bianco, 42nd Street "was his last big hit, his swan song." This Tony–nominated wardrobe, designed by Theoni V. Aldredge, is on rotating display at the Wick Theatre and Costume Museum in Boca Raton, Florida. The West End production opened at the Theatre Royal Drury Lane on August 8, 1984. The career of teenaged Catherine Zeta-Jones, a chorus member in the 1984 West End production, was launched when a vacation and an illness felled both the actress portraying Peggy Sawyer and her understudy when one of the producers happened to be in the audience. Zeta-Jones filled in and was impressive enough to be cast permanently in the role shortly afterward. A San Francisco production opened at the Golden Gate Theatre on February 19, 1985, and ran through July 20, concurrently with the original Broadway production. The Sydney production of 42nd Street opened on the 2nd June, 1989 at Her Majesty's Theatre in Sydney. It closed 28th July, 1990. The show starred Leonie Paige, Nancye Hayes, Toni Lamond, Todd McKenney and Barry Quinn. Bramble revised the book for and directed the Broadway revival, with choreography by Randy Skinner (dance assistant for the original production). It opened, after 31 previews, on May 2, 2001, at the Foxwoods Theatre (formerly the Ford Center for the Performing Arts), where it ran for 1,524 performances. The cast included Michael Cumpsty as Julian, Christine Ebersole as Dorothy, Kate Levering as Peggy, and David Elder as Billy. Meredith Patterson, who made her Broadway musical debut in the chorus and was the understudy for the role of Peggy Sawyer, took over the role in August 2001. Todd Lattimore, who had been a swing and understudy, took the role of Billy. Other notable replacements included Patrick Cassidy and Tom Wopat as Julian and Shirley Jones and Beth Leavel as Dorothy. The Broadway revival production, by UK Productions, toured the UK in 2007. The cast included Paul Nicholas as Julian for the first part of the tour, later replaced by Dave Willetts, Julia J. Nagle as Dorothy, Jessica Punch as Peggy, Graham Hoadly as Bert Barry, Shirley Jameson as Maggie Jones and Ashley Nottingham as Billy. An Asian tour of the Broadway revival played major venues throughout China and South Korea, with an English–speaking company directed by Mark Bramble. The cast included Paul Gregory Nelson as Julian, Natalie Buster as Dorothy, Kristen Martin as Peggy, and Charles MacEachern as Billy. A production directed by director/choreographer Randy Skinner made its debut at the Westchester Broadway Theatre in Elmsford, New York, on September 24, 2009, through February 2010. A one-act condensed version played for several months at the Reno Eldorado Hotel, Reno, Nevada, showroom using recorded music track, closing in October 2009. A production directed by director/choreographer Jon Engstrom debuted at the Theatre Under The Stars in Houston under the Artistic Direction of Frank Young, and then moved to its second season at The 5th Avenue Theatre in Seattle. It starred Sylvia Brooks as Dorothy Brock, with musical direction by Bob Linder. A new production was staged for the Chichester Festival at the Chichester Festival Theatre in summer 2011. It was directed by Paul Kerryson with new choreography by Andrew Wright and starred Kathryn Evans as Dorothy and Tim Flavin as Julian. This production transferred to Curve in Leicester for the Christmas 2011 season (breaking all previous box office records for the theatre). Tim Flavin reprised his role, Ria Jones played Dorothy and Daisy Maywood portrayed Peggy. UK Productions mounted a provincial UK tour of the show in 2012 with Dave Willetts reprising the role of Julian, Marti Webb playing Dorothy, Graham Hoadly as Bert Barry, Carol Ball as Maggie Jones and Mark Bramble directing. A slightly updated version of the 2001 revival, revised and directed by Mark Bramble and choreographed by Randy Skinner, began a United States tour in September 2015, opening in Salt Lake City, Utah, on September 22. Matthew J. Taylor played Julian Marsh, Caitlin Ehlinger played Peggy Sawyer, and Blake Standik played Billy Lawlor. A West End revival began previews on March 20, 2017, at the Theatre Royal Drury Lane, where the show had its original London production, with an official opening night on April 4. Mark Bramble once again directed and Randy Skinner choreographed. The cast included Sheena Easton in her West End debut as Dorothy Brock, Clare Halse as Peggy Sawyer, Stuart Neal as Billy Lawlor and Tom Lister as Julian Marsh. The opening night was attended by HRH The Duchess of Cambridge in her role as Royal Patron of the East Anglia Children's Hospices (EACH). On March 19, 2018, Lulu took over from Easton as Dorothy Brock for a 16-week tenure, and Ashley Day took over from Neal as Billy Lawlor, with Lister and Halse remaining in the show. Steph Parry - who in March 2018 joined 42nd Street as understudy for the roles of Dorothy Brock and Maggie Jones - took over from Lulu as Dorothy Brock on July 9, 2018. Bonnie Langford took over as Dorothy Brock on September 3, 2018, until the show closed on January 5, 2019. Auditions for 1933's newest show, Pretty Lady, are nearly over when Peggy Sawyer, fresh off the bus from Allentown, Pennsylvania, arrives in New York City with valise in hand. Billy Lawlor, already cast as one of the juvenile leads, notices her and hopes to charm her into accepting a date with him. He informs her she has missed the audition but he can help her bypass that process, but choreographer Andy Lee has no time for Billy's latest conquest and tells her, "Amscray, toots." Embarrassed and flustered, she rushes off, only to run into director Julian Marsh. One-time star Dorothy Brock, indignant at being asked to audition for a role, is reassured by Bert that he merely wants to make sure the songs are in her key. Despite his feeling she is a prima donna past her prime, he agrees to cast her in order to get financial backing from her wealthy beau, Abner Dillon. Outside the theatre, writer Maggie and chorus girls Anytime Annie, Phyllis, and Lorraine take pity on Peggy and invite her to join them for lunch and some advice. They encourage her to show them a dance routine that is witnessed by Julian, who decides there might be room for one more chorus girl after all. Julian learns that Dorothy is seeing her old boyfriend, Pat Denning, behind Abner's back. Knowing this could destroy the show's future, he decides to put an end to the affair. A phone call to an unsavory acquaintance brings Pat a visit from a couple of thugs who convince him to break it off with her. The show's cast then departs to Arch Street Theatre in Philadelphia, for the out-of-town tryout. On opening night, someone bumps Peggy, who trips and crashes into Dorothy, knocking her to the stage. Julian fires Peggy on the spot. Dorothy's ankle is broken, and the show may close. The chorus kids, certain Peggy could fill the lead role, find Julian and tell him that she's a fresh young face who can sing and dance circles around Dorothy. He decides it is worth a shot and rushes off to the train station to catch her before she departs. At Philadelphia's Broad Street Station, Julian apologizes to Peggy and asks her to stay and star in the show, but she responds that she has had enough of show business and wants to go home to Allentown. Dumbfounded, he tries to coax her with the words "Come on along and listen to the lullaby of Broadway..." After the cast joins him in the serenade, she decides to accept his offer. Forced to learn the part in two days, Peggy is on the verge of a nervous breakdown when she has an unexpected visit from Dorothy, who has been watching the rehearsals and realizes that beneath her nervous exterior, Peggy is good, "maybe even better than I would have been." She even offers a little friendly advice on how to perform the last song, "About a Quarter to Nine." The opening night curtain is about to rise when Julian, who is completely in love with Peggy at this point, stops by for a last minute lip-lock and pep talk in which he utters the now iconic line, "You're going out there a youngster, but you've got to come back a star!" The show is a huge success sure to catapult her into stardom. In addition, even though she is invited to and expected to attend the official opening night party, she decides to go to the chorus one instead. Julian is left alone onstage with only a single ghost light casting his huge shadow on the back wall. He quietly begins to sing, "Come and meet those dancing feet on the avenue I'm taking you to...42nd Street." Oscar – Onstage rehearsal pianist for the show "Pretty Lady"
In the 2001 revival, a reprise of "Getting Out of Town" followed "Lullaby of Broadway" and "With Plenty of Money and You" followed "About a Quarter to Nine", "Keep Young and Beautiful" followed "Dames", and "I Only Have Eyes for You" followed "We're in the Money". For the 2017 West End revival, “Boulevard of Broken Dreams” was added into the show for Sheena Easton. ^ a b "42nd Street History". Archived from the original on 23 September 2011. Retrieved 10 March 2019. ^ a b "Floridian Renovating 42nd Street". 28 April 2003. Archived from the original on 2005-10-29. ^ "Broadwayworld listing". Broadwayworld.com. Retrieved 20 March 2011. ^ "Season History 1985" shnsf.com, accessed July 5, 2016. ^ Steven Male. "UK Productions listing for '42nd Street'". Ukproductions.co.uk. Archived from the original on 2011-02-13. Retrieved 20 March 2011. ^ Bowie-Sell, David (5 August 2015). "42nd Street to open at Theatre Royal Drury Lane". Whatsonstage.com. Retrieved 2017-03-31. ^ Longman, Will (4 November 2016). "Sheena Easton to make West End debut in 42nd Street". Whatsonstage.com. Retrieved 2017-03-31. ^ Smith, Neil (5 April 2017). "42nd Street gets royal seal of approval". BBC News Online. Retrieved 20 April 2017. ^ Bowie Sell, Daisy (23 February 2018). "Lulu and Ashley Day to join cast of 42nd Street". Whatsonstage.com. Retrieved 2018-02-22. ^ Wood, Alex (15 June 2018). "Steph Parry to take over from Lulu in West End 42nd Street". Whatsonstage.com. Retrieved 2018-06-15. ^ Wood, Alex; Hewis, Ben (13 July 2018). "Bonnie Langford joins cast of 42nd Street and closing date announced". Whatsonstage.com. Retrieved 2018-07-13. ^ Bowie-Sell, Daisy (2017-12-01). "Nominees announced for the 18th Annual WhatsOnStage Awards". WhatsOnStage.com. Retrieved 2018-04-09. ^ "Olivier Awards 2018: the winners in full". The Stage. 2018-04-08. Retrieved 2018-04-09. Wikimedia Commons has media related to 42nd Street (musical).